Last night the sacred Triduum opened with the celebration of the Lord's Supper. With that celebration, the symphony of the Paschal Mystery began. A symphony is a single piece of music consisting of three major sections, or movements, and the Triduum is very much a symphony of prayer and worship. The First Movement, on Holy Thursday, concludes with the stripping bare of the altar and with the people of God following Christ to an altar of repose. Liturgically, it is most significant that there is no final blessing and dismissal, as we would have at any other Mass; in other words, the liturgy HAS NOT ENDED. Today, as we gather this afternoon to commemorate the second movement of the Paschal Symphony, this idea continues. There is no "ordinary" entrance; I'll have more to say on that in a moment. But when the priest first speaks, it is not to give an "Opening Prayer." The rubrics are very specific that the priest offers this first prayer "with hands joined" rather than the using the orans gesture normally used for an opening prayer? Why? Because this prayer today is NOT an opening prayer; the celebration TODAY is a continuation of the celebration begun last night. At the end of this afternoon's service, notice again that there is no final blessing or dismissal; the ministers simply leave the sanctuary. Personally, several things always "grab" me about today's service. 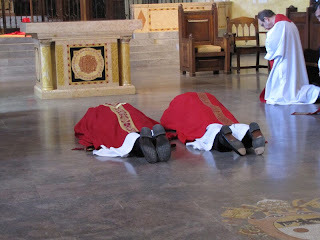 First, at the outset, the priests and deacons prostrate ourselves in prayer. No other gesture or posture is as profound in our liturgy, in my opinion. It is an act of total surrender. To be vested as a minister of the Gospel and then, in the presence of the People of God, to lie down before God is a most awesome and vulnerable moment. For me, I am reminded of the only other time I did this: at the Mass of Ordination when I was ordained a deacon. At ordination, and now on every Good Friday, I prostrate myself before God the people I have been ordained to serve. As I said, nothing is more awesome and vulnerable. Second, there is the sense I spoke of above that this is not a "new" service, but that we are simply entering a new phase of the sacred worship initiated last night. In many monasteries and convents, and now even in some parishes, people don't leave after the Holy Thursday celebration. Often serving in shifts throughout the night, people are in constant prayer and adoration awaiting today's movement to commence. They will remain after today's movement, in prayer and adoration, until the solemn Easter Vigil tomorrow night on Holy Saturday. One Paschal Symphony in three movements. Third is the Rite of Communion celebrated during the service today. This is the one day of the entire year in which Mass is not to be celebrated, which would mean, normally, that communion would not be received. As one writer has put it very well, it is a day in which we should feel a "Eucharistic hunger" as Christ is in the tomb and we await Resurrection. For many centuries, in fact, communion was NOT received in Catholic churches. With the exception of those sick, imprisoned, or otherwise unable to attend Mass itself, communion should not be received outside of Mass, although bishops may make other decisions based on their assessment of pastoral need. I was once assigned as deacon to a Cathedral parish in the Midwest. After the Good Friday service, a lady approached me in great agitation. She was a visitor from Eastern Europe, and she asked me to confirm whether or not this church was a Catholic Church. I assured her that it was, and that, in fact, it was the Cathedral church of the diocese. She seemed a bit relieved, but even more confused. I asked her what was wrong. She told me that in her part of the world, Catholic churches did NOT distribute communion on Good Friday, in honor of Christ's passion and death. She was concerned that perhaps she had mistakenly come to a Protestant church and that she had "missed" a Catholic celebration. So, I ponder whether the liturgical reforms of Holy Week initiated in the 1950's by Pope Pius XII might not have gone too far by introducing a Rite of Communion outside of Mass into the Good Friday service. This is a good day, and good opportunity, to experience the void left by Christ between his death and his resurrection. 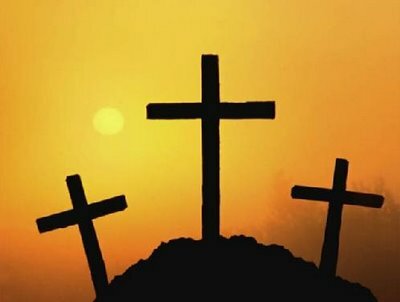 Just one deacon's reflections. . . . May you all have a prayerful and blessed celebration of Good Friday: the Second Movement of the Paschal Symphony. I agree... this morning we had our Walk of Witness in town, followed by an ecumenical service which I actually pull together: we - about 700 this year- silently followed a cross through town and placed it in the centre of the (Anglican) Cathedral: An ecumenical group of people with a learning disability then presented the symbols of the passion and told us what they meant to them: we read the Passion in parts: we had a fine homily from a Catholic scripture scholar on the theme of the supper/sacrifice of the Lamb of God. This year, I led the prayers- and you would have recognised them, although I failed to "Flectamus Genua" . We sang the Reproaches. . What was missing? I think that was a good sign for us for this day. So wasn't this a "proper" Good Friday service after all? I think it was, and all the better for sharing it with our local Christian "Communion".